A trip to discover Vietnam and all its mysteries. 19 days tour getting behind the scenes and discovering the breathtaking beauty and welcoming heart of Vietnam. ARRIVAL INTO VIETNAM – HANOI NOI BAI AIRPORT (flight details tbc). This morning, we’ll drive west of Hanoi for around 1.5 hours to Duong Lam village, a purely agricultural village of the Northern Red River delta where you’ll discover many hundred-year-old houses, in one of the few remaining ancient villages in Vietnam. This ancient village has a history dating back some 1,200 years. One special thing about the village is that most of the buildings here are made of laterite and mud, two materials that are abundant in the area. In-city private car transfer to Hanoi Train station and check-in for your sleeper train. Overnight train SP3 dep Hanoi at 22.00 and arrive Lao Cai 06.10 (next morning). Meet your guide and driver for your private transfer to Sapa, which takes around 50 minutes. The drive uphill on the Hoang Lien Son mountain to Sa Pa has outstanding views of valleys and terraced rice fields along the way. After breakfast your guide will show you around for a brief introduction of this charming town. At the market, ethnic minority people of different groups wearing their traditional costumes made by themselves comes every day selling local products including vegetables, bamboo shoots, mushrooms and medicinal herbs etc. Later you will follow the footsteps uphill to the top of Ham Rong Mountain beautiful scenery of the town and surrounding area. NOTE: You may discuss with your guide the remainder of today’s (and following days’) activity in this region. We understand that guests have different walking/trekking ability – and we are able to remain flexible regarding grade and distance of all activity. This morning, will visit Ta Phin commune 14 km southeast of Sapa town. Located in a large valley and surrounded by high mountains, which are covered by pine trees and forest, Ta Phin Commune is home to the Red Zao and Black H’mong ethnic groups. Although living close to each other for years, these two ethnic peoples are very different and you will have the opportunity to discover how and why. Take a short drive to the centre of the valley and enjoy an easy walk following a village path around the valley, paying visit to H’mong hamlets, which are scattered from the bottom of the valley to the higher mountain slopes. Continue your walk to the Red Zao village in which you will meet groups of women making handicrafts includes embroidered clothes, handbags etc. Transfer back to Sapa for lunch and noon break. Afternoon, you will be picked up at about 14.00 and then drive uphill to see the Silver Waterfall and Tram Ton, the highest mountain pass in Vietnam at 1,800 m above sea level. There are magnificent views of the Hoang Lien Son Mountain range as well as spectacular landscapes of the whole area. Return to Sapa by later afternoon and remainder of the day is free and easy to relax. Today you will spend the whole day exploring the spectacular Muong Hoa valley, considered the most beautiful valley in the region. We drive out of the town, following the only road built on the side of a mountain, overlooking the valley and magnificent landscapes composed of high mountains, deep valleys, river streams, waterfalls and terraced rice paddies. We leave Ban Ho late afternoon for journey back to Sapa, before transfer to Lao Cai station for taking the night train to Hanoi which arrives in Hanoi early at 05.30 to 06.00 next morning. Train SP4 arrives in Hanoi Train station at 05.10. We’ll meet you from the train and take you for breakfast in Hanoi. 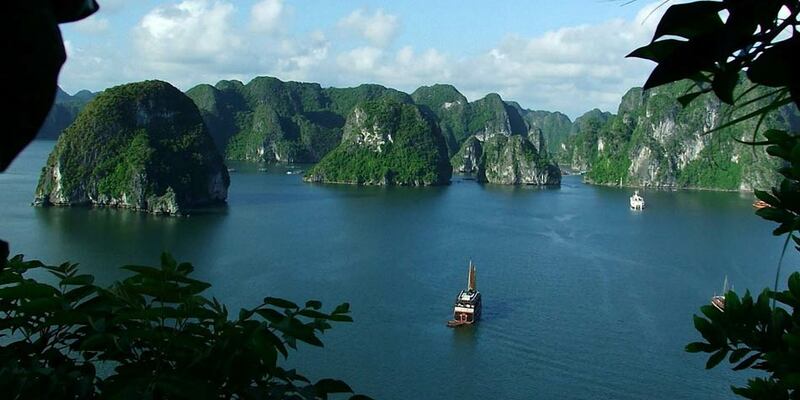 After breakfast your guide will accompany you on the drive to your Halong Bay Cruise. This pleasant journey through the Red River Delta takes around 3.5 hours, with a refreshment stop along the way. 12.00 – 12.30 : Embark at Hon Gai International harbour. 10.00 : Check out of the cabin. Start cruising towards the harbour while an A la carte lunch is served. 11.45 – 12.00 : Disembark. After you disembark your cruise, your private transportation will be waiting for you to direct to Hanoi Noi Bai Airport for your onward flight. 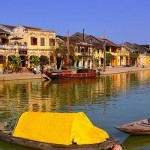 We’ll arrive at the airport in good time to check in for your domestic flight to Hue. Scheduled domestic fight from Hanoi Noi Bai Airport (HAN) to Hue Phu Bai (HUI) airport (approximately 90 minutes). Meet you at Hue Phu Bai Airport (HUI) and private transfer to your hotel in the city. Conclude this spledid day with a visit to Thien Mu Pagoda, which overlooks the Perfume River and is the official symbol of the city of Hue. Thien Mu means “elderly celestial woman”, and refers to an old legend about the founding of the pagoda. From here, cruise back to Hue centre on the legendary Perfume River. The views on both sides of the river with the citadel, town, gardens, pagodas, towers and temples, provide good photo opportunities while enjoying this short 45 minutes cruise. After breakfast, depart with specialist guide and driver to the former DMZ by private vehicle taking the route on Hwy 1 through Dong Ha and then on to the Ben Hai River (17th Parallel division). Cross the river by the old footbridge and then on to visit the Vinh Moc Tunnels. The tunnels were built to shelter people from the intense bombing of Son Trung and Son Ha communes in Vinh Linh county of Quang Trị Province in the Vietnamese Demilitarized Zone. The villagers initially dug the tunnels to move their village 10 metres underground but the American forces designed bombs that burrowed down 10 metres. Eventually the villagers moved the village to a depth of 30 metres. Return to Hue by coast road and optional stop at Quang Tri Citadel if desired. The Second Battle of Quang Tri began on June 28 and lasted 81 days until September 16, 1972, when the Army of the Republic of Vietnam (ARVN) finally defeated the North Vietnamese Army (NVA) at the ancient citadel of Quang Trị and recaptured most of Quảng Trị Province. During the battle, the Army of the Republic of Vietnam, backed by the United States military, expended more than 80,000 tons of ordnance. When compared to its 1968 counterpart, 1972 is more wartorn with most of the city being reduced to rubble. This was one of the last major battles of the pre-1973 withdrawal of US troops and was probably instrumental in convincing the US that they would unlikely to prevail over the NVA long-term. Today is free and easy for you at your leisure. Private transfer to Da Nang Airport (flight details tbc). Scheduled domestic fight from Da Nang (DAD to Saigon Tan Son Nhat Airport (SGN) taking approximately 75 minutes. An early start this morning will give you the best opportunity to visit the floating Market of Cai Be. Leave your resort by boat for the short cruise to the market. Every day, approximately 400-500 boats filled with fruits, vegetables and other products anchor along the banks of the river, waiting for traders and customers. Try your hand at bargaining with the locals and perhaps try some splendid fresh tropical fruits. Return to your resort for breakfast. Then we’ll cast off again by boat for a meander on the Mekong. Visit local gardens and houses to see orchards, rice crisped producing process etc. We’ll have a local lunch featuring fare unique to the delta region. 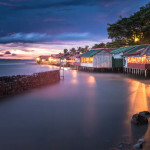 Cruise along the river and canals of An Binh island to see the peaceful and tranquil life of local villagers, admiring the marvellous natural setting of the Mekong Delta region. Mid-afternoon, we’ll arrive back at the private dock of your resort, and the remainder of the day is free for you to relax by the pool or take a cycle ride around the quiet lanes of Cai Be. Enjoy a leisurely morning at your resort, before the drive back to Saigon and check-in to your hotel. Morning departure (exact pickup time tbc) , we’ll transfer you from your hotel to the river pier. Join your speedboat for around 1.5 hours fast cruise up river. 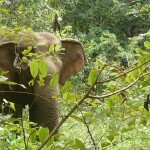 Within 15 minutes, the banks of the river change from city sprawl to lush jungle. A light breakfast of sandwiches or pastries, fresh tropical fruits and Vietnamese iced coffee (Ca phe sua da) is served, as your guide explains rural traditions and aspects of riverbank life. After a short documentary, your guide will lead you through the historic Cu Chi Tunnels and the numerous sites, which show how the Viet Cong waged war. The Cu Chi Tunnels are an elaborate underground community made up of 250 km of tunnels and chambers below the city. The tunnels were dug with simple tools and bare hands during the French occupation in the 1940s, and further expanded during the Vietnam War in the 1960s to provide refuge and a defensive advantage over the American soldiers. Despite all the bombings in their town, the Cu Chi people were able to continue their lives underground, where they slept, ate, planned attacks, healed their sick, and taught their young. Some even wed and gave birth underground, but over 10,000 lost their lives here. Late morning, enjoy a delicious traditional Vietnamese lunch by the river, consisting of authentic fried spring rolls, chicken and beef dishes and soup. After lunch, we’ll return by road to Saigon and back to your hotel by mid-afternoon and the remainder of today is free and easy for you. This morning – and depending on your departure flight time, we’ll visit Ben Thanh. Ben Thanh Market has been the focus of the city’s commercial life since it was completed under French rule nearly a century ago. It has outgrown the main structure and now spills over into the adjacent streets. It’s a great place to start an education in local cuisine – very local. It’s all there for you to see and sample for next to nothing. Pho, Bun – the full collection of tasty southern Vietnamese soups are on sale and much more. It’s a great place to stock up on souvenirs, T shirts, bags, coffee and other local products that sell at higher prices in the city’s more upmarket shops. But even if you’re not on a shopping mission, Ben Thanh Market is a must see. At a time to suit you, your guide will accompany you to Tan Son Nhat Airport (SGN) for for outbound flight.